How can you improve the privacy and energy efficiency of your windows without using blinds and curtains? The simple answer is to use Zipscreen or Ziptrak privacy screens. You can find these products at Sheerview Window Furnishings where we always have the best range and the best prices in window coverings of all kinds. In theory, all window coverings help improve energy efficiency in the home to some sort of extent. In practice, it’s definitely the case that some window coverings do a much better job of improving energy efficiency than others. The goal is always to create additional layers for light particles to have to penetrate before they have the chance to inflict their heat energy on surfaces within the room. To understand this, it helps to know that light is a form of electromagnetic radiation. Windows today are sold with energy star ratings, to help you choose the most energy efficient options. Surprisingly, window coverings don’t yet have a standard of energy star ratings. If they did, products like Zipscreen and Ziptrak would easily be the five-star products others would have to be measured against. Blinds and curtains certainly help to cut down the amount of heat energy entering a room by creating a barrier for the light to penetrate. Most of the electromagnetic radiation from the light will either be reflected or absorbed by the material, depending on the colour, thickness, and porosity of the material. Any stray light that makes it through will have been slowed down and weakened. The one flaw of curtains and blinds when it comes to energy efficiency is that they’re mounted on the inside of the window. This means light has already had a chance to hit the surface of the window and excite particles within the glass, causing them to heat up, before continuing on to strike the surface of the curtains or blinds. The glass of the window itself then becomes a thermal conductor, a fact you can easily check by touching a pane of glass that has been exposed to strong sunlight for more than a few minutes. Top-quality products like Ziptrak and Zipscreen are mounted on the outside of the window, blocking light before it hits the window. The actual amount of light blocked depends on the options chosen for the product, but you can generally expect the ambient temperature and glare by a significantly noticeable amount. Under these circumstances, the window does not have as much opportunity to heat up, and the window won’t act so much as a miniature radiator and electromagnetic radiation transmitter. The problem of an uncovered window is that it allows people to see in, when you may not want them to be able to see in. Most types of curtains and blinds will do an effective job of helping to correct this problem, except they may do it so well that they make it more difficult for you to see out. Zipscreen and Ziptrak improves privacy & have varying degrees of translucency depending on the options selected, and because of the way they are designed, you’ll have a better opportunity to see out than anyone will have to see in. Available in a range of sizes from 5m x 3m to 7m x 5m. Australia was made for those that love outdoor living. Our climate is ideal for whiling away hours every day basking in the sun if you are lucky enough to have that much free time. However, this enviable climate is not without its pitfalls as the elements often interrupt and spoil the good times. Everything from wind, insects, rain and even temperatures that are maybe a little too hot to handle cause us to retreat indoor on occasion. But, with Ziptrak blinds in place, you won’t have to worry about abandoning your outdoor entertaining or relaxation spaces when things take a sudden turn. Here at Sheerview Window Furnishings, we have been working with customers from Oxenford to the Gold Coast for twenty years. In that time we have seen many different products come and go, but endeavour to ensure that the best on the market is always available and accessible from our showroom. Those that want to add colour, style or functionality to their home by adorning their windows and outdoor areas with products that are high-quality and cover a range of options including, curtains, blinds, awnings and shutters. One of the most popular products that we currently stock are Ziptrak blinds. Once the favoured choice of restaurants and cafes, they have since become a hugely sought after solution that affords homeowners the chance to create their own outdoor areas, safe from the elements all year around. They are an Australian product, invented and manufactured here and as such they were built will the conditions that we face in this country in mind. As such, given their innovative design and the fact that they afford any property an aesthetically pleasing solution that takes huge steps forward from the traditional options of the past, while simultaneously delivering the desired levels of protection, they have become the most recognisable privacy screen in the country. 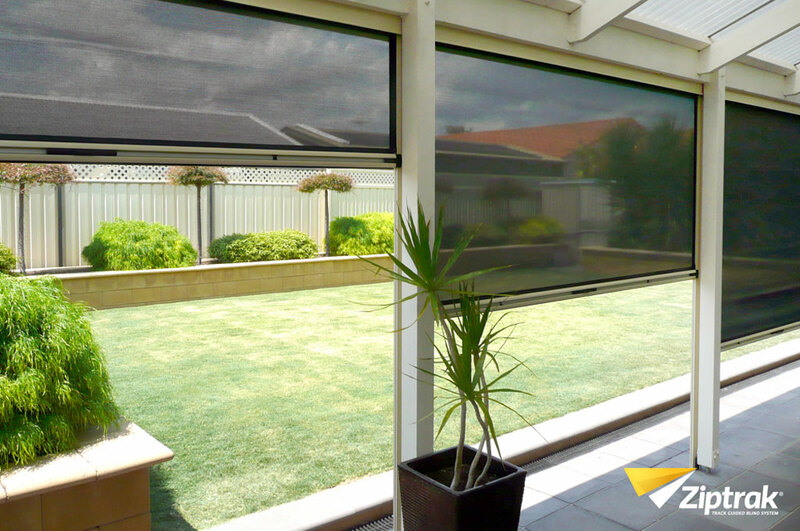 The reason that Queensland natives love Ziptrak awnings so much is due to their ease of use. Even in the middle of winter if you decided to have a few friends over and wanted to create a warm environment that is completely sealed off, having this product at your disposal makes this immediately possible within seconds. In terms of the method of operation, you won’t find any crank handles, cords or buckles anywhere. All that is required is the click of the two-way centre lock release mechanism and to lift the blind up or guide it down to the required height that you want. To seal off your warm environment completely the lock will click into place at the bottom. Whether you are on the inside or outside you can release the blind, which is a completely unique feature that can only be found on Ziptrak outdoor blinds. What’s more, this blind comes with a spring balanced tension system, which makes it so easy for anybody to move it up or down with minimal effort. This feature also ensures that it is possible to stop at any interval. It’s smart and sleek track-guided design will guide the blind to the desired height and the tension system will hold it in place. One of the main benefits that our customers here at Sheerview Window Furnishings love the most about this blind is the fact that fully seals off any area that it is installed in. This is the most common request that we get at our showroom and one of the key reasons that the Ziptrak system has proven to be one of the most popular modern innovations and designs that we supply. The side spine sealed into the side channel of the mechanism makes this dream a reality. The absence of cords, zips, buckles and cranks also ensure that your entertaining, balcony, patio or deck areas are that little bit safer. This is of particular importance and concern to those that have children on the property and is just another wonderful and clever feature of these blinds. Past customers with limited movement ability or those that require a little extra assistance have gained immeasurable benefits from installing Ziptrak blinds in their home, not only for those that opt for the traditional design but for those who chose to invest in the motorised option. Nothing changes in terms of the aesthetics of the product once it is installed in your home. All motorisation is concealed within the headbox and roller tube. A wall-mounted control makes it possible for you to set the blinds as you wish. Furthermore, those that install more than one in their home have the ability to raise or lower them at the same time or individually. Here at Sheerview Window Furnishings, there are five different colour options available to choose from when you decide to install this Ziptrak product in your home. With regards to the material type, it is possible to choose between clear or tinted PVC options as well as sunscreen mesh. 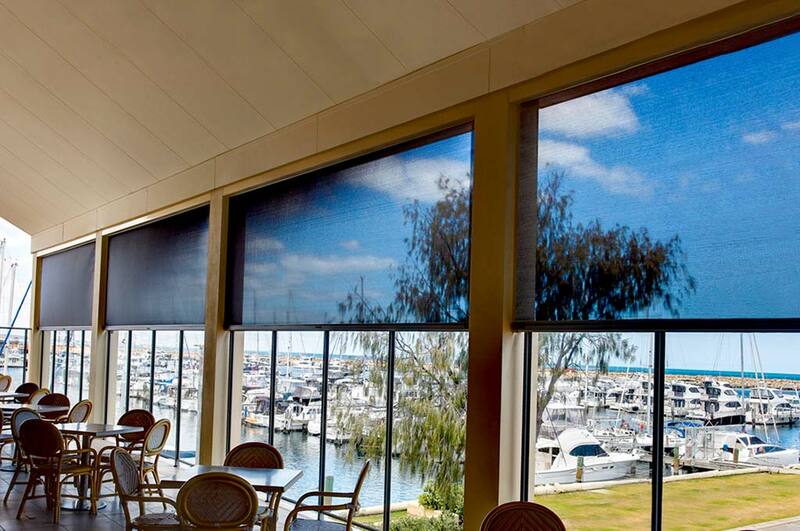 Those that choose PVC can take comfort in the fact that your new blind was engineered to stand up to the harsh Australian climate and provide a complete block out of wind, rain, dust and debris and offers to up 93% UV block. It is an exceptional choice of material for those that wish to maintain the temperature within a space. For those that prefer the mesh alternative, the advantages that this material affords are many. Up to 99% UV block is possible as well as 96% wind and rain blockage. What’s more, if the sun is a little too low or it’s light that bit more piercing you can trust that this material will reduce the glare while maintaining airflow through your space. What’s more, this option is the ideal choice for those that want to achieve a high degree of privacy. How Much Do Ziptrak Blinds Cost? Those already convinced and wondering about the Ziptrak blinds price are encouraged to get in touch with the experts here at Sheerview Window Furnishings. The price that you pay will depend on the size of the blinds that are required and also with regards to the spec of the blinds that you choose to install in your home. Rest assured, our team leave nothing to chance when it comes to delivering the perfect Ziptrak blinds. We will drop out to your home and measure up the spaces that they are required for twice. Once we have custom made the blinds to your specifications, we will then determine the best possible time to complete the installation that will result in the least intrusion and disruption to your daily life. With Ziptrak outdoor blinds installed in your home, you won’t have to hope that the weather will hold ever again. You will have the luxury of a sealed off, easy to use space in your home that delivers undeniable style and the best of Australian products backed by warranties that will stand you in good stead. Here at Sheerview Window Furnishings, we invite you to call, email or drop into our showroom in Oxenford today to speak with one of our experts. Before long we will have the perfect solution installed in your home that will add incredible value and comfort that you can enjoy for many years to come. Zipscreen’s strength is in design, both technically and visually. Built for coastal environments and designed to use the same cassette housing for the mechanism as our drop screen solutions. Allowing the use of multiple solutions around a property with the same streamline aesthetics. For seamless privacy screens up to 7 meters wide that doesn’t steal your views the Zipscreen Extreme is our most popular solution. Built specifically to withstand the corrosive effects of coastal living the Zipscreen privacy screens are a great product that lasts. Its important to note that Ziptrak is designed in South Australia for Australian conditions and is undoubtedly the most recognisable privacy screen solution in Australia. Ziptrak privacy screens provide wide range of accessories to make your screen easily usable and accessible. To take advantage of our experience with industrial textiles and their unique qualities, contact us and we’ll help you select the most appropriate solution for your circumstances and budget. For example, your homes proximity to the ocean determines the level of corrosive properties your awning materials are exposed to and ultimately affects both options and lifespan of a particular textile. We’re always happy to help and if you’re in the Gold Coast area drop us a line and we can discuss your awning options.